A few passing clouds, otherwise generally sunny. High 81F. Winds S at 10 to 20 mph.. Partly cloudy during the evening followed by cloudy skies overnight. A stray shower or thunderstorm is possible. Low 61F. Winds SSW at 5 to 10 mph. FARMINGTON -- Minnie Agnes Cowley, 102, of Farmington passed away peacefully at Southbrook Skilled Nursing Center in Farmington on January 2, 2019. 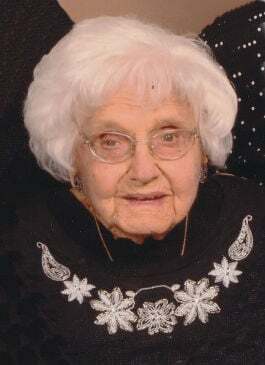 She was born February 10, 1916, in Farmington, to the late Lewis “Pop” Hopkins and Nettie Emma (Meyer) Powell. Minnie worked for 9 years after high school, at the Rice-Stix Factory that made men’s pants, but left for a few years to raise her daughters. She later returned to Rice-Stix Factory, where she retired in 1978. Minnie was a devoted member, as well as the oldest member, of the Memorial United Methodist Church in Farmington and attended regularly until health interfered. She was always appreciative of the pastoral calls and glad tidings from her church family. Minnie was seldom idle and was known as a doer. She had an exemplary work ethic, a positive outlook, strong faith and loved playing games. She is best described in an article “Best Cooks I Know,” by Janet Douglas. She was preceded in death by her parents; husband of 58 years, Walter Milton Cowley; siblings, Martin and Harry Powell, Lola Ragsdale, Helen Larby, and Herbert Powell in infancy; son-in-law, Ronald Pirtle; great-granddaughter, Gracie Layne Despard, and step-great-grandson, Derek Burch. Minnie was a loving mother to her three daughters, Marilyn Pirtle, Bonnie Henson, both of Farmington, and Nettie Mae (Mrs. Ray) Deluca of Maryville, Illinois; a devoted grandmother to her grandchildren, Carmen Pirtle, Brad (Anita) Henson, Sonya (Dave) Bahr, Christopher (Maya) Gierse, Rodney (Janna) Pirtle, Adrianne (Josh) Trussell, and Monique (Mike) Tsipursky; nine great-grandchildren; a great-great-granddaughter on the way; three step-great-grandchildren; one step-great-great granddaughter; many nieces and nephews also survive. Visitation will be held at the C.Z. 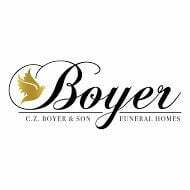 Boyer & Son Funeral Home -- Taylor Chapel in Farmington, Friday, January 4, 2019, from 5 p.m. until 8 p.m. Visitation will resume at the Memorial United Methodist Church in Farmington, Saturday, January 5, 2019, at 9 a.m. until the time of service at 11 a.m. with Rev. Scott Hall officiating. Interment will follow at Parkview Cemetery in Farmington. Memorials may be directed to The Memorial United Methodist Church or Farmington Pet Adoption Center. Arrangements are under the direction of C.Z. Boyer and Son Taylor Chapel. Please view full obituary and share condolences online at www.czboyer.com.